New figures on Northern Ireland's trade show a surge in business to record levels. Sales to customers in Great Britain and the rest of the world have hit £24bn, up by 4%, or almost £1bn. The data, compiled by the Northern Ireland Statistics and Research Agency (NISRA), covers 2016 and relates to products and services. Great Britain remains the most valuable market, worth £14bn annually. Sales to the Republic of Ireland are worth more than £3bn. Helped by the weakness of the pound, Northern Ireland's trade in all markets has registered improvement. 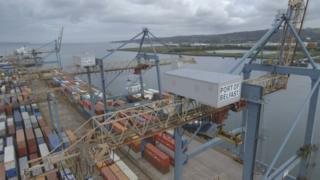 Manufacturing is the best performing sector, accounting for 60% of all Northern Ireland's exports.